Andrew Knizner was behind the plate for Dominic Leones inning of work Tuesday and took a pitch over the wall in the eighth in his one at bat. Mike Matheny called Knizner the most improved player they've had from last year to this year because of the awakening of his bat. 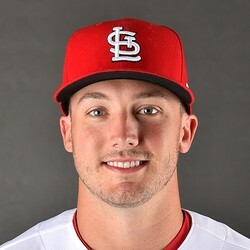 Knizner wont be in the majors this year, but could be a good player to stash in dynasty leagues. Expect Knizner to start the year in Double-A, with a chance to hit Triple-A this year.